Mr Harish Bijoor touched on the basics of advertising and explored the present, past as well its future with special refer- ence to the representation of men in Indian media over the years. The different events that were held during the meet were Ad-Centric (paper presentation), Adzap (Ice breaker), Ad making (viral video competition), iQ (Quiz), Pitch it Right, workshops based on ad photography, social media marketing, print ads, audio visuals, etc. The key event for media meet was the panel discussion held on 3rd September which was moderated by Prof Anil Pinto. The panelists for the evening were Ms.SnehaIype, Ms.Valerie Pinto, Mr.VikramSood, Mr. VimalParathsarathy and Mr.VipulThakkar. The Battle of Creativity truly brought out the talents and skills of the participants and got together students from various parts of the country in a sprit of harmony and togetherness. 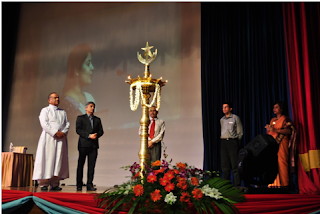 The seventh Media Conclave was held at the Ohio conference hall at 10 a.m. on September 10, 2011. 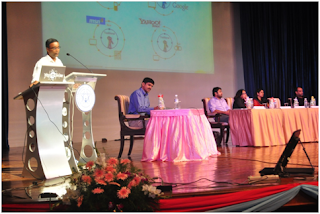 Research papers were presented by the Traditional Media team under the guidance of Prof. Naresh Rao and in the presence of the guest of honor Mr. Chandan Nandy- Chief News Editor, The Deccan Herald, Bangalore, and other faculties of the Media Studies department of Christ University. Students presented paper on topics like: Community radio- A key to rural development, The perception of colors in newspapers and Are ads on television more effective than ads in print? 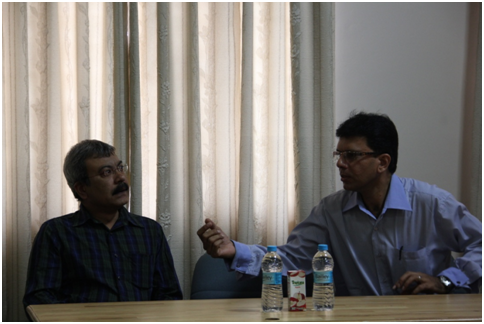 Following the presentation, the guest lecture was delivered by Mr. Chandan Nandy who spoke about the changes in journalism over the years. He stressed on the point that newspapers should be open to all kinds of ideas, story ideas, and subject matter and so on, hence stressing that the news from rural regions should also be given importance. He also stressed that journalism cannot be taught in a class and so, students should be asked to do extensive field work. Following the speech, Mr. Nandy along with Prof. Naresh Rao released special copies of the University news letter ‘Commix’ by the students of First M.S. Communication. On 9th September 2011, Transtalkies held the film screening of the Documentary film “Partners in crime” directed by Ms Paromita Vohra. Ms Paromita Vohra herself was present to present her film. Paromita Vohra is a documentary filmmaker and writer based in Mumbai whose films explore issues of politics, feminism, culture and desire. Partners in Crime explores the grey horizons of copyright and culture in times when technology is changing the contours of the market. The film also takes you through a story about art, crime, love and money which is running the piracy market be it a pirated DVD openly available of the pre released film or “inspiration” from old songs which is blended with modern orchestra and becomes a super hit. The film was well made and it presented a serious topic with a little humor without diluting the importance of the issue, which was Piracy and ownership intellectual rights. All the hard work put in by the post graduate students of the Department of computer Science has finally paid dividends. 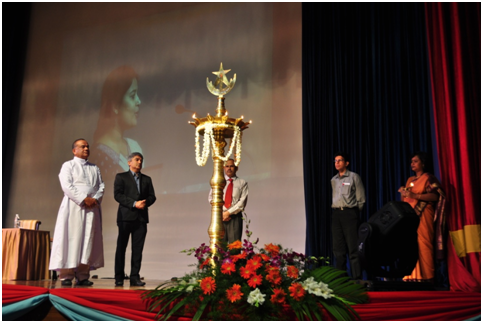 The annual national IT festival GATEWAYS 2011 was inaugurated by Mr. Tilak K, Chair, University Relationships Nokia-Siemens Networks. This academic year saw the organization of a festival that surpassed all expectations and boundaries. This was propelled with a turnout of 34 colleges and 298 students taking part from across the country. 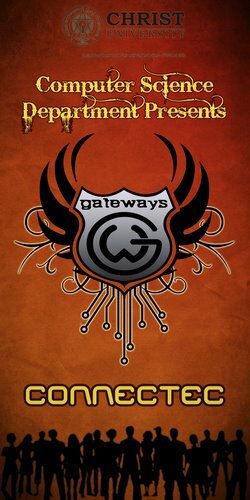 Gateways this year saw the organization of events such as IT Quiz, Paper Presentation, Dumb Charades, Gaming, Web Page Designing, Best Manager and a lot more along with the added attraction introduced this year- Gateways Carnival, made this fest more exciting than it has ever been before with double the fun, excitement and experience with its attempt to make its presence felt not only throughout the campus but in the entire city as well. There was a festive feel within the campus with the Gateways Carnival being organized. It was also aimed to involve all the other Christites, at the same time spreading the festive spirit. The carnival was filled with fun, games, pomp and show. A few cultural performances by the post graduate students of the Computer Science Department added to the success and colors of Gateways. With the organization team going all out in the marketing this year, the publicity of Gateways extended not only across the campus but right through the city. Blossoms start with an Intra Departmental Cultural Fest and culminates in to an Inter Deanery Competitions. This includes Music, Dance, Literary, Art & Theater events. Under the above mentioned categories, we had twenty different events organized last year which are as follows: Rangoli, Triology, Cartooning, Pot Painting, Collage, Flower arrangement, Short story/essay/poetry, Extempore, Debate, Potpourri, Dumb Charade, Jam, Quiz, Indian Music, Western music- electric, Western music- acoustic, Indian dance, Mime, Street Theater & Proscenium Theater. For the last two consecutive years, CUIM has bagged the OVERALL WINNERS - TROPHY! We are looking forward to a hat-trick win this year too..! Christ University, Department of Management studies, stalwartly fosters the experiential learning through regular interaction with industry experts, professionals and learned professors from various institutions. It Endeavors to enrich students’ through organizing Seminars and discussion forums on current issues on regular basis. As one such initiative, we are organizing a Panel Discussion: on HUMAN CAPITAL ANALYTICS - The Missing Link: Measuring Human investment Returns And Industry Academia interface. management of various events to the competitive spirit that the festival involves. chosen for this year ‘Connectec’. only throughout the campus but in the entire city as well. encourage the young bubbling minds.